If you have ever tried sitting on a trotting horse, you may have found the experience very uncomfortable. The trot can be very bouncy, but there is a way to smooth out the bouncing and jarring. Posting is to rise out of the saddle seat for every other stride of the horse's forelegs, thus smoothing out the jolts you will encounter if you just sit. This makes riding the trot much more comfortable for you and your horse. It doesn't matter if you ride English or western. There are times when trotting is appropriate and more comfortable, no matter how you ride. The easiest way for you to learn and the most comfortable for the horse is to begin learning to post the ​trot on a lunge line. This way, you can learn to stay with the horse without worrying about steering or inadvertently pulling on the bit and confusing or hurting the horse. If you aren’t able to start on a lunge line try riding your horse in an arena or fenced ring where it will be inclined to trot in a straight line without much guidance from you. Practice sitting two-point or half seat. Lift your bottom out of the saddle, tense but don't grip tightly with your upper legs and stand slightly in the stirrups. Try to control the stance with your muscles, rather than by putting all your weight in the stirrups. You’ll have the same position as a martial arts ‘ready stance’ or a downhill skier. Do not use your hands to steady yourself. Make sure you are feeling relaxed and secure at the walk before cueing your horse to trot. The cue is a pressure of the legs, sitting deeper in the saddle or tap with the heels depending upon the schooling and sensitivity of the horse. 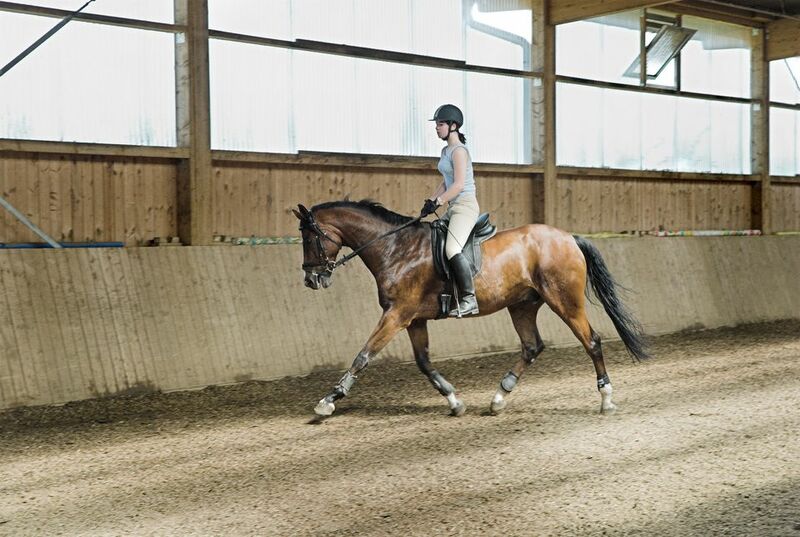 With your horse at a steady trot try to sit and keep your back flexible to absorb the bumps. The upward and forward thrust you will feel is called the impulsion. If your horse has very little impulsion, you will find sitting the trot very easy. If your horse has strong impulsion, you will be lifted out of the saddle. Once you have discovered the rhythm—and it may be helpful to count one, two, one, two. Try rising on one and gently lowering on two. The action is up and forward with the pelvis, standing in two-point and sitting on every other stride. Continue this rhythm as your horse trots steadily. Try to stay with the motion to avoid getting left behind and ‘double bumping'. Concentrate on keeping your lower leg motionless from the knee down. Don’t lift with your toes, grip excessively with your knees, let your legs to swing, or let your ankles to cave in. Many beginners shove their feet forward. Looking down, you should not be able to see your toes. The basic position of the good seat is maintained at every gait. Now that you can feel the rhythm and are able to post while on the longe line, you can try picking up the reins. The challenge will be to keep your hands still, while your body moves up and down to the rhythm of the strides. Don’t let your hands move up and down, but flex through shoulders and slightly through the elbows and wrists. Don’t feel discouraged if you still get bumped around a bit, or your friend ‘gets it’ right away, and it takes you two or three lessons. You can learn to post, and soon you will not be aware you are doing it. Practice as much as you can and soon posting will be an effortless habit that makes the riding the trot much more comfortable for you and your horse. With enough practice, you will find you can post without stirrups or even a saddle. Stand behind a chair or high table in a riding position: knees slightly bent, head up, back relaxed but straight, and fingers resting on the chair or table at elbow height. Now rise and fall as if you were posting. Concentrate on keeping your hands motionless on the table. Getting Some Wear and Tear? If the inside of one leg is getting rubbed, check that you are sitting square in the saddle. Check that your stirrup leathers are the same length. Compensate for differences in leg length with a shim in your boot. Most people have one leg longer than the other affecting balance in the saddle. Chaffing on both legs means your legs are swinging. Practice keeping your lower leg still and wear riding pants with leather knee patches or tall boots for extra grip. You may already be familiar with exercises in the saddle, and you should be able to do them at the trot. These are easiest and most safely done on a longe line. Try reaching forward and touching your horse’s ears, turn and touch its tail, bend to touch each toe and ride with your arms out spread eagle. The exercises encourage muscle tone and balance. Don’t try to pick yourself up with your upper body. Your shoulders should stay relaxed. There shouldn’t be a lot of brute strength involved in posting. A few muscles might start to complain, and you could get winded. Horseback riding is exercise. It may look like sitting, but then so does bicycle riding. Think of the balance and effort it takes to ride a bike. What would happen if you were to stop balancing and pedaling? Allow yourself to be lifted by the impulsion. Some beginners bend forward. Your back should be almost vertical, with only your pelvic bones making the up and forward arc. Your horse saddle bridled and ready to ride. A person who can competently lunge your horse. A ring or arena with smooth footing for your horse.